Sen. Orrin Hatch, R-Utah (2nd-R), and Senate Judiciary Committee Chuck Grassley, R-Iowa (C-Rear) arrive to view the FBI report on sexual misconduct allegations against Supreme Court nominee Brett Kavanaugh, on Capitol Hill, Oct. 4, 2018 in Washington. The nomination of Judge Brett Kavanaugh to fill an open seat on the U.S. Supreme Court is moving toward a final vote as early as Saturday. First though, senators are on Thursday reviewing an FBI report on allegations Kavanaugh sexually assaulted a woman when both were teenagers and that he exposed himself to another woman during their first year of college. Kavanaugh has denied the accusations. FILE - U.S. Supreme Court nominee Brett Kavanaugh is pictured testifying before the Senate Judiciary Committee on Capitol Hill in Washington, Sept. 27, 2018. 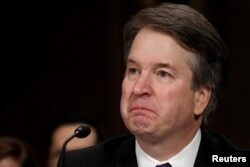 What is usually a sharp partisan battle over the lifetime appointment to the nine-member court has polarized the U.S. Senate with the majority Republicans accusing Democrats of unnecessarily dragging out the process, while Democrats say Republicans are rushing to confirm Kavanaugh without properly considering the allegations against him. 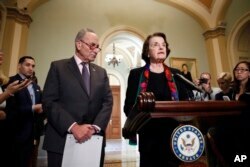 Judiciary Committee Chairman Sen. Chuck Grassley said early Thursday the panel had received the FBI probe materials, and that he and ranking Democrat Sen. Dianne Feinstein had agreed on a process of alternating, equal access for senators from both sides to review the information. The FBI report is confidential and senators will be allowed to read it in a special secure room in the Capitol. It is not clear what, if any, of the material will be made public. Senate Judiciary Committee Ranking Member Sen. Dianne Feinstein, D-Calif., speaks to the media, accompanied by Senate Minority Leader Chuck Schumer, D-N.Y., about the FBI report on sexual misconduct allegations against Supreme Court nominee Brett Kavanaugh, on Capitol Hill, Oct. 4, 2018 in Washington. Senate Majority Leader Mitch McConnell promised late Wednesday the lawmakers would have time to review the contents before a so-called cloture vote that would officially end debate about Kavanaugh's nomination.That procedural vote could happen as early as Friday morning and set up a final vote potentially on Saturday. White House spokesman Raj Shah said that after the "most comprehensive review of a Supreme Court nominee in history," the White House is "fully confident" Kavanaugh will be confirmed. FILE - Christine Blasey Ford testifies before the Senate Judiciary Committee, Sept. 27, 2018 in Washington. Christine Blasey Ford testified before the Senate Judiciary Committee last week, telling lawmakers she was "100 percent certain" it was a drunken Kavanaugh who pinned her down on a bed, groped her, tried to take off her clothes, and put his hand over her mouth to muffle her screams for help.Kavanaugh testified he has never assaulted anyone. 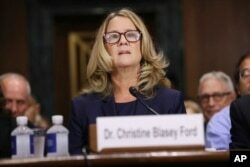 A lawyer for Ford criticized the FBI investigation in a statement late Wednesday, saying it did not include an interview with Ford or other who could back up her testimony. "We are profoundly disappointed that after the tremendous sacrifice she made in coming forward, those directing the FBI investigation were not interested in seeking the truth," Ford's counsel said. President Donald Trump defended his nominee and criticized the way the nomination has proceeded In a Thursday tweet. 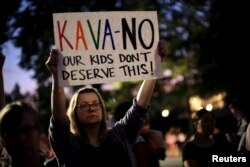 Activists gather outside the U.S. Supreme Court to hold a vigil in opposition to U.S. Supreme Court nominee Brett Kavanaugh in Washington, U.S., Oct. 3, 2018. In a poll released Wednesday by NPR, Marist and PBS Newshour, 47 percent of respondents said they had a negative view of Kavanaugh versus 36 percent who said they view the judge positively.Another 18 percent were unsure or had not heard of Kavanaugh. On another question, 45 percent of respondents said they believe Ford is telling the truth about what happened when the two were in high school, while 33 percent said they believe Kavanaugh. Overall, 48 percent of respondents said they oppose Kavanaugh's nomination and 41 percent said they support him joining the Supreme Court. Republicans hold a slight 51-49 majority in the Senate, and with Vice President Mike Pence playing the role of tie-breaker if necessary, they would need a minimum of 50 votes to confirm Kavanaugh. If confirmed, Kavanaugh — an appellate judge and judicial conservative — would replace retired Supreme Court Justice Anthony Kennedy. The nine-member court is currently operating with eight justices.